Powers/Abilities: Diomedes possibly possessed the normal human strength of a man of his size, height and build who engaged in extensive physical exercises. He was a determined and infallible ruler and charioteer with skills in armed combat. His chariot was pulled by four mares made vicious by feeding them human flesh. History: (Greek/Roman Myth) - Diomedes was the son of Ares, the Olympian god of war, and Cyrene, daughter of Hypseus, King of the Lapith tribes of Thessaly. Ares gave Diomedes a team of man-eating mares passed down from King Oenomaus of Pisa, who was another of his mortal sons who had been long killed by the hero, Pelops. Diomedes took the throne of Thrace by force or by marrying into its royal family. (Greek/Roman Myth, Hercules III#1 (fb)) - King Eurystheus of Mycenae meanwhile sent Hercules to Thrace on his eighth labor to claim the man-eating mares of King Diomedes. A young man named Abderus from Pherae joined Hercules with several volunteers to help drive the man-eating mares into the sea, but Diomedes and his soldiers came to attack Hercules on his approach. The mares ate Abderus while Hercules was distracted, but Hercules tamed the mares by throwing to them their own master, Diomedes, to feast upon. The act repulsed the Thracian army and Hercules brought the tamed mares to Mycenae and abandoned them there. Not wanting the now tamed horses, Eurystheus released the mares to the wild. While wandering home the Thrace, they were attacked and killed by wild animals. On his death, Diomedes was succeeded by his son Polymnestor who sent ships to help defend Troy from the Greeks. 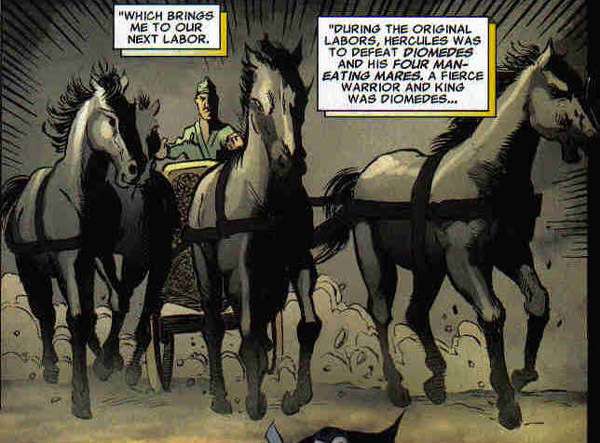 The man-eating mares also appeared in a flashback in Avengers I#39 (April, 1967), but without Diomedes.